Fig. 1. The Spiritual Magazine, vol. 1, no. 8 (ca. Dec. 1824). Fig. 2. John Rees, A Collection of Psalms and Hymns from Evangelical Authors, 2nd ed. with Appendix (London, 1826). Images courtesy of Eric Stedfeld, from Union Theological Seminary, Burke Library. Fig. 3. Edward Mote, Hymns of Praise (London, 1836). 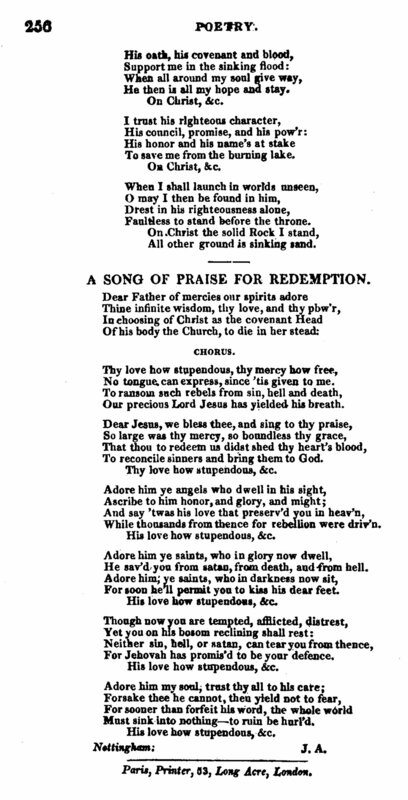 In 1836, the hymn appeared again in its full form in Edward Mote’s Hymns of Praise (London, 1836 | Fig. 3). It was marked “Original,” meaning Mote claimed it as his own hymn. Mote made a change similar to what Rees had done, “I rest upon unchanging grace,” and tweaked the line “His oath, his cov’nant, and his blood.” Note the inclusion of the same heading from 1824. In 1850, the hymn appeared in Jonathan Whittemore’s Supplement to All Hymn Books, in four stanzas, based on Rees’ 1826 version, with new alterations in the final stanza, “When the last awful trump shall sound, O may I then in Him be found,” which might have been a borrowing from the hymn “Guide of my youth! to Thee I cry” (stanza 3: “Cleans’d in Thy blood may I be found, when the last awful trump shall sound”). Other changes are less clear. The line “Support me in the whelming flood” seems to have come from William Bradbury’s Golden Censer (NY, 1864). The line “When he shall come with trumpet sound” appeared as early as 1887 in Daniel Towner’s Hymns New and Old. That there is no plagiarism in adopting that hymn as my own, it may not be uninteresting, and may satisfy the minds of many who have seen it in Rees’, Denham’s, Gadsby’s, and other selections, with Rees as the author, and in mine as the original, if I give the outline of its history. One morning it came unto my mind as I went to labour, to write an hymn on the ‘Gracious Experience of a Christian.’ As I went up Holborn, I had the chorus, ‘On Christ the solid rock I stand, all other ground is sinking sand.’ In the day I had the four first verses complete, and wrote them off. On the Sabbath following, I met brother King as I came out of Lisle Street Meeting . . . who informed me that his wife was very ill, and asked me to call and see her. I had an early tea, and called afterwards. He said that it was his usual custom to sing a hymn, read a portion, and engage in prayer, before he went to meeting. He looked for his hymn book but could find it nowhere. I said, ‘I have some verses in my pocket; if he liked, we would sing them.’ We did; and his wife enjoyed them so much, that after service he asked me, as a favour, to leave a copy of them for his wife. I went home, and by the fireside composed the last two verses, wrote the whole off, and took them to sister King, and visited her every day after tea, while she lived (five or six days); and never had more heavenly converse with a saint of God than in those heavenly, heart-replenishing visits, we mutually rejoiced in the great things of God. A later edition of The Gospel Herald (1880), p. 18, claimed “the hymn was written in 1825, on the occasion of the author hearing of an awful shipwreck on the Goodwin Sands.” This does not accord directly with Mote’s story, but the general dangers of seafaring in that area likely had an influence on Mote’s references to stormy gales and sinking floods. Goodwin Sands was notorious for shipwrecks. One particular account from the time period in The Annual Register, November 1825, pp. 155-156 (HathiTrust) described the complete destruction of a trade ship known as Ogle Castle. This wreck may have been what the writer of The Gospel Herald had in mind, but that event postdates the first publication of the hymn, circa December 1824, and therefore could not have been a direct inspiration for Mote’s text. Text: Analysis. The refrain reflects the imagery given in Matthew 7:24-27, regarding the wise man who built his house on the rock, and the foolish man who built his house on the sand. The bold claim that a Christian’s hope is built on nothing but the blood of Christ is summed up well in 1 Corinthians 3:11, “For no one can lay a foundation other than that which is laid, which is Jesus Christ,” or Hebrews 6:19-20. The seafaring metaphors (gales, anchors, floods, etc.) could be inspired by real-life events and experiences, as Mote lived in a time when boats were still a vital form of transportation. These same images are common and prominent in many other hymns, such as “It is well,” “Eternal Father, strong to save,” and “The storm is passing over.” Scriptural allusions for these images include Isaiah 43:2 (“When you pass through the waters, I will be with you; and through the rivers, they shall not overwhelm you”) and Psalm 107:23-30. The “burning lake” undoubtedly refers to the lake of fire in Revelation 20. The idea of being dressed in righteousness could either refer to the breastplate of righteousness in Isaiah 59:17 and Ephesians 6:14, or the robe of righteousness mentioned Job 29:14 and Isaiah 61:10, or thinking in the context of standing before the throne, the robes washed white by the blood of the Lamb in Revelation 7. Tune. This text is most commonly set to the tune SOLID ROCK by William Bradbury (1816–1868), for the Golden Censer (1864 | Fig. 4). The tune has a strong, confident quality, emphasizing the main idea of the text. Bradbury’s version reduced the hymn to three stanzas and introduced the alteration in stanza three (“whelming”). Bradbury’s tune also appeared in his Devotional Hymn and Tune Book that same year. Fig. 4. Golden Censer (1864). Last year when that happened … I was in Scandinavia, and I was leading worship at our church there in Stockholm. As you can imagine, everyone was just really shaken by the event. It’s the kind of thing that turns the place upside down. Everybody is related or knows somebody that is affected. So I got together with a couple of my friends, and we were talking about it. We just wanted to write a song that was going to help [the] church respond to people coming to church, respond to what had happened, and just be able to make a bit of sense of it. We wrote [“Cornerstone”] basically because that hymn says, “My hope is built on nothing less than Jesus’ blood and righteousness.” That just felt like the right thing to be singing. … To me, there's nothing else you want to be singing in a time like that … projecting that Christ is the foundation, even when everything looks uncertain.